A strong ridge remains over the far N Atlantic and Arctic region, centered over Iceland and Greenland. The result is a strong pattern dynamic further south with continuous troughs / lows developing over the Atlantic and pushed into SW Europe and the Mediterranean. Two deep upper lows will again contribute to severe weather, one across the E Mediterranean and another one moving across the Bay of Biscay towards NW Iberia. At surface, a cyclone is traveling from Ionian sea into the Aegean sea with a sharp cold front being the focus for severe storms. ENH risk has been issued for S Aegean sea, W Crete island and into SW Turkey with threat for severe storms, capable of producing severe winds, torrential / excessive rainfall and large hail. A cyclone with sharp cold front pushes across the S Greece and Aegean sea from the west, where storms are fueled by marginal instability within strong shear and large scale forcing. A line of storms with discrete supercells is likely to develop, spreading towards ENE with time during the afternoon and evening time. 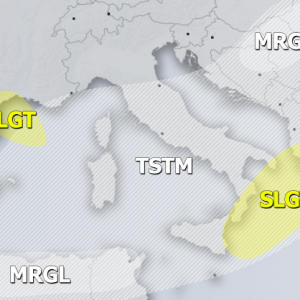 SLGT risk has been issued for areas surrounding the ENH risk, including W Turkey, central Aegean sea and parts of E Mediterranean with threat for more isolated threat for severe storms. Enhanced threat for excessive rainfall exists along the WSW Turkish coast. SLGT risk has been issued for W Bay of Biscay into extreme NW Iberia where threat for severe winds in excess of 90 km/h exists. MRGL risk has been issued for N Portugal into NW Spain with threat for isolated severe storms, capable of producing marginal hail (a lot of accumulated small hail / graupel is possible locally) and severe winds.